These gorgeous David Yurman earrings are crafted in 18k white gold and set carved chalcedony stones and round diamonds of an estimated 2.00 carats. The chalcedony stones in one earring are slightly faded. 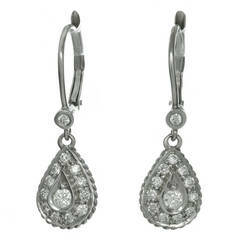 The drops on these versatile earrings are detachable. Made in United States circa 2000s. Measurements: 0.90" (23mm) width, 1.53" (39mm) length. 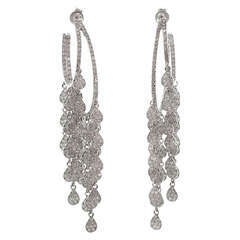 David Yurman Albion Earrings - . Faceted Hematine set in Sterling Silver. Surrounded by pave diamonds with a .26 cts weight. Earrings measure 15 mm. 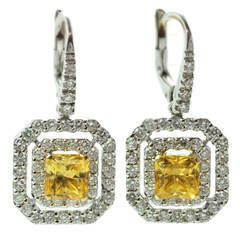 David Yurman Diamond 18K Yellow Gold Ladies Earrings Width: 18mm Diamonds: 0.75cttw approx.